To be able to scrapbook, it is imperative that you have scrapbooking supplies to use for your projects. It is also wise that you have storage for all your scrapbooking supplies so that when you need something, it can easily be found. 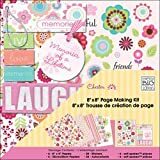 It is a good idea to be well organized with your embellishments, papers, tools and such so that when you are ready to scrapbook, there will be no distraction. You can do your favorite hobby with all your scrapbooking supplies close at hand. There are many kinds of storage options available for you to choose from so that your scrapbooking supplies are in order. You can look into bookcases as storage for your scrapbooking tools. Use different sized boxes to store smaller tools such as glue, double sided tapes, embellishments and more. You need to have your own area so that you can concentrate on your scrapbooking as well. So what are the scrapbooking supplies that you really need to make your own scrapbooks? 1. 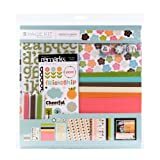 Paper: There are so many scrapbook papers available that you will be overwhelmed the first time you go shopping for one! You need to decide the size that you need. If you already have an idea, that is a good start. But you can always start with a 12” x 12” or an 8” x 8” size paper. With these sizes, you can cut them if you need a smaller size paper for your scrapbooks. There are also many brands of scrapbook paper for you to choose from. There is Martha Stewart Scrapbooking, Die Cuts With A View, Basic Grey and Cosmo Cricket to name a few. 2. Adhesive: Look for acid free adhesives so that the photographs in your scrapbooks have a longer life. Consider using double sided tapes when laying out your photographs in the scrapbooks. Always the labels of the scrapbook adhesives you are buying to make sure that they are the right kind for you. 3. Embellishments and tools: If you can cut in a straight line, it would be an advantage. However, it will be wise to invest in a paper trimmer. Crafts scissors and hole punches are also a must-haves for scrapbooking! You need to keep your eye opened for discount scrapbooking supplies. There are so many great deals out there but you need to know where to look for them. Imagine getting scrapbooking supplies at great discount prices! • Look for discounts and sales for scrapbooking supplies in your local newspaper. Watch out for store advertisement to see what they have on sale. • You can find great low prices of scrapbooking supplies from browsing the internet. Join forums and message boards of fellow scrapbook enthusiasts. You can get great ideas there. • Always look out for coupons! They are great savers. They are usually inserted in local scrapbooking stores brochures and ads. Scrapbooking is an ideal hobby if you like crafts. You can get lost in preserving wonderful memories and the best thing about it is that you are making a way for the future generation of your family to share those memories.